Shortly after clicking the download link on your e-mail receipt your course will download to your Mac. The course is provided in a ‘zipped’ (‘compressed’) folder. The folder should be automatically ‘unzipped’ when the download is complete. Please see additional instructions below if your download doesn’t automatically unzip. 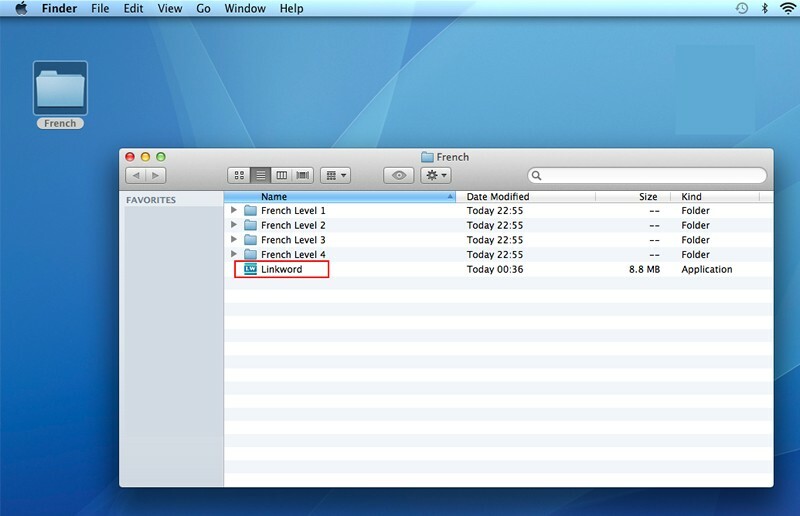 When your download is complete please copy the ‘French‘ folder (or whatever language you purchased) from your downloads folder to the desktop of your Mac as shown below. When you open the ‘French’ folder from your desktop you should see a screen similar to below. Please click the ‘Linkword’ icon to start the Linkword software. IF YOUR MAC DOESN’T AUTOMATICALLY UNZIP THE SOFTWARE FOR YOU, PLEASE FOLLOW THESE STEPS. 1. When the download is complete, copy the file called ‘French_Levels_1-4_Mac.zip’ to your desktop. 2. Double click on the the file called ‘French_Levels_1-4_Mac.zip’ to unzip it. 3. 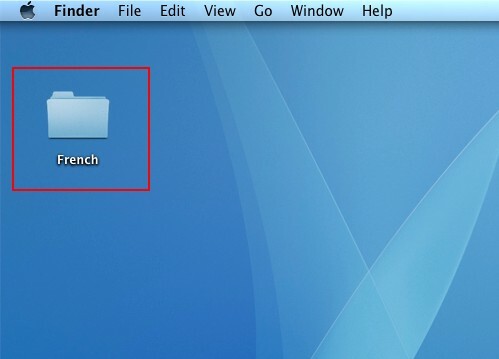 After the file has been unzipped you should see a new folder on your desktop called the file called French_Levels_1-4_Mac. 4. 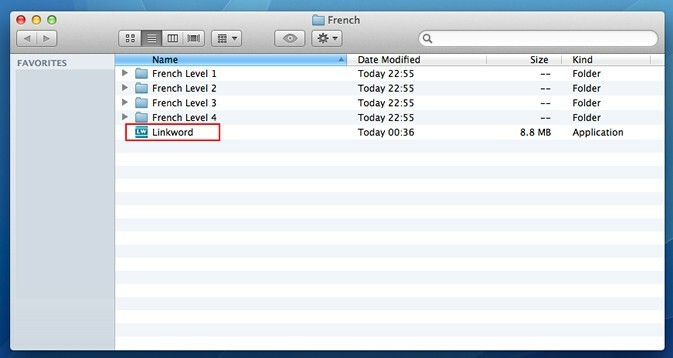 Open the folder called French_Levels_1-4_Mac. Inside this folder you should see a folder called ‘French’. 5. Open the ‘French’ folder mentioned above and you should see a screen similar to below. Please click the ‘Linkword’ icon to start the Linkword software.